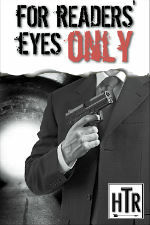 Hunt To Read: For Readers' Eyes Only: Plot vs. Characters, or "The Novelization of TV (and Vice Versa)"
For Readers' Eyes Only: Plot vs. Characters, or "The Novelization of TV (and Vice Versa)"
Over at The A.V. Club this week, there were the usual collection of articles leading up to a new season of Breaking Bad. The media throng was perhaps intensified somewhat because the final eight episodes are about to start, and fan expectations are very high for the show's writers to "stick the landing." As one such fan, it was very interesting to read Donna Bowman's excellent article entitled (SPOILERS INSIDE) "What's the Right Way to Watch Breaking Bad?" Without giving anything away, the article tackles the growing question (as far as television shows are concerned) as to whether or not characters or plot are more important to viewers. As with many A.V. Club articles, the comments are the most thought-provoking part of the piece, with many great arguments on both sides of the issue. My take? I think that TV is becoming increasingly like literature in that its creators are finding ways to engage readers with both well-thought-out plots, and three-dimensional, fully-formed characters that leap off the page (or in this case, screen), engage the audience, and resonate with them. Of course, fiction writers have had to do this for years. Even the most elaborately, brilliantly-plotted out novel will fail if the characters are just cardboard cutouts without any discernible personality or ethos driving the action. As a writer, I've always tried to balance the two, but it's not as easy as it sounds. Some folks will try to convince readers that it's our job to paint a picture for you folks, but as a reader, I know that's as impossible as it is foolhardy. Readers read precisely because they want to do some of the work, because it's fun to let their imaginations run a bit. Which is why increasingly as a reader I've been thrown off by some of the long "laundry list" descriptions of a character's costume in a lot of the books I read as of late. While some people may "set the scene" to the extent that they have to know what the heroine's hairpin looks like, how each of the 532 jewels that encrust it are arranged, that's something that for me is "over-characterization," something that turns "plot" into "plod." Part of it is that we've been spoiled by TV. Within two seconds on a TV show, I can see exactly what a character is wearing. That two-page description in a book could take a few minutes. With time pressures so great on people nowadays, I imagine that a lot of folks just want to get to "the good stuff." This isn't meant to be a blanket statement by any means; I'm sure there are a bunch of folks out there who love to really luxuriate in the slower pace of a novel, dressing descriptions and all. And of course, one of the brilliant things about novels compared with TV is that you can really get inside a character's head and see what they're thinking. But one thing that TV has reinforced in this novelist's mind is that the old adage "show, don't tell" is incredibly important not only for plot, but for characters. Much more effective than the laundry list of clothing is showing how a character acts in a given circumstance. Action moves plot forward. Plot moving forward keeps you folks (readers) turning the pages. Everyone wins! So let me ask our readers: has watching TV changed the way that you read novels? Which do you prefer more, character-driven stories, or plot-driven stories? And why?